Another cold front has moved in today and the temperature is plummeting from the 50's to the 30's and lower. It's expected to be milder than the last one, but that's still several days of no sewing time for me. I worked late last night getting my wreath top done, but the sandwiching, quilting and binding will have to wait. I might put my gloves on tomorrow and brave my cold sewing shed long enough to sort through my Christmas fabrics and decide what to use up next. Or, I might stay in my mom's toasty warm house and work on crocheted tree ornaments. I'll decide when I see how icy the front yard is. It's been raining here so much lately that there's no way to get to my shed without splashing through puddles. Only 5 more months to go until May -- that's when the rain lets up. I finished the four center blocks for my wreath yesterday. 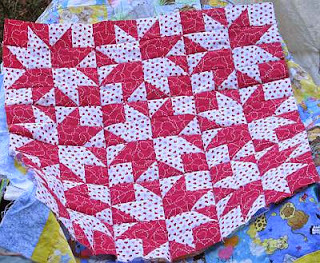 Thanks to strip-piecing methods, these blocks worked up fairly quickly despite the little 1-inch finished squares. Next, I started on the eight outer blocks of the wreath. Ugh, it took an hour just to mark eight strips in preparation for the 90-degree points! At this rate, I would be lucky to finish the top before Christmas. So I went back to the drawing board and simplified my design. No more points! I began piecing my leftover green strips of various lengths to neutral strips of whatever length needed to make 8.5 inch strips. This is going much faster. If I had the whole day tomorrow just to sew, I could actually finish most of this project before Thanksgiving. But I don't, so maybe I'll finish it up on Friday. Today didn't go quite as planned. I did get the turkey wall hanging hung on my mom's wall. And I did try canned diced tomatoes on my sandwich: not bad, but not great...better than store-bought fake tomatoes but still not as good as the real homegrown tomatoes (I used English muffins as my bread so the tomatoes wouldn't make a soggy mess). But I didn't dig out my Christmas fabric stash. I've been wanting to make a wreath wall hanging for quite some time, so this afternoon, I dug out my small pieces (less than a FQ) of green fabrics and cut a bunch of 1.5-inch strips. Tomorrow, I'll start making the 4-patch units for the center part of the wreath. I'm probably crazy, but I'd like to get this project done by Thanksgiving. Yeah, I'm crazy! At 3 o'clock yesterday, my sewing shed was still only 55 F, so I returned to computer work and odd little tasks that could be done in a warmer environment. Today, my shed was a warm 70 F and everything is back to normal pretty much. The only casualty of the arctic weather is my tomato garden. We've had the longest growing season in years and years, and I've been thoroughly spoiled with home grown tomatoes. Today, I had to resort to slicing a store-bought artificial tomato for my sandwich, the kind that look like tomatoes but crunch like cucumbers and taste vaguely like tomato water. Yuck! I think I'd be better off draining the liquid from a can of diced tomatoes and spreading the remaining tomato pulp on my sandwich. I might just try that tomorrow. Today, I put the binding on my turkey wall hanging finally, and glued the beak and eyes on. It's sitting on a shelf waiting for the glue to dry. Tomorrow, I'll put away the fall colored fabrics and dig out my stash of Christmas fabrics. Oh boy! Isn't it fun to play with fabrics and dream of what they can become? It froze harder last night, so I'm bundled in my flannels and fleece, sipping hot chocolate and playing on the computer. 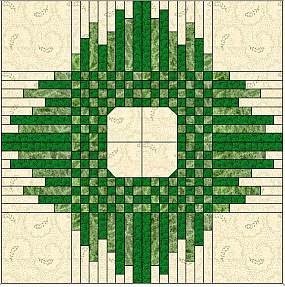 While flipping through my 4-patch file in EQ (Electric Quilt), I found this virtual quilt design that I had been playing with at some point in time. It sure doesn't look like a 4-patch to me! 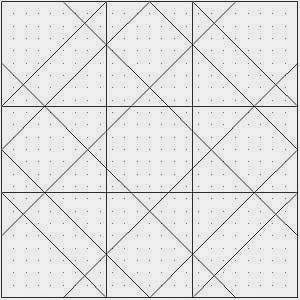 After studying the situation a bit, I found that I had been playing with a block in EQ called "A Snowflake." It took me while to find the original block in my variation of it, but it's there. 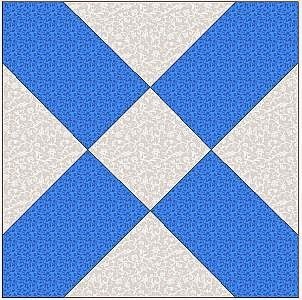 This is the colored block from the virtual quilt. This shows all of the lines I added to the original drawing. 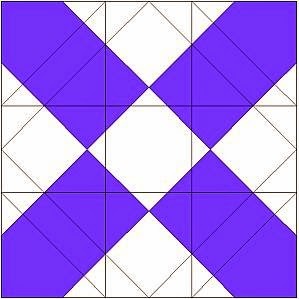 This shows the original coloring of the original block within the new block design. 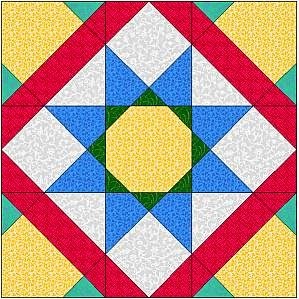 It's an interesting design and makes a striking quilt pattern, but why is it in my 4-patch file? more nights of freezing temperatures are forecasted, so it looks like I won't get any sewing done until Wednesday. Time to plan projects rather than sew projects! Here's the layout of the critter top I posted yesterday. The completed top, made with 8-inch blocks and 1-inch and 2.5-inch borders, measures 31 x 39 inches. This isn't the exact layout that I planned to use. Somewhere in the sewing process, I got a couple of blocks sewn in different places than I originally planned, But that's okay. I still ended up with a cute top that will someday be a cute baby quilt. Today, I played with Electric Quilt to see what a scrappy Christmas quilt might look like. Several years ago, I used up a considerable part of my Christmas fabric stash, but last summer I found a hidden stack of Christmas fabrics to replenish that stash. Since I'm not short on fabrics, I decided to upsize (is that a word?) to 12-inch blocks and use four plain blocks in my design. A top like this, with 1.5 and 4 inch borders, would measure 47 x 59 inches. The next step was to play with colors. 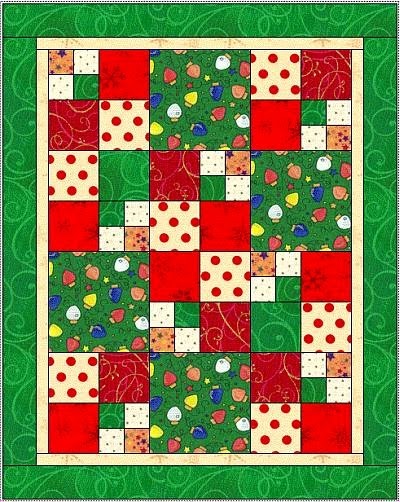 I like this version, but I'm not sure how many red and green fabrics I have left. I think most of my stash is slightly non-traditional: snowmen (blue), gingerbread men (tan), Santa on the farm (red). Hmmm, that Santa fabric might be perfect for this. Brrrr! It's cold! I'm on the fringe of the arctic blast that's sweeping North America. There's freezing rain and ice 20 miles north of me, and it's a balmy 55 F forty miles south. The low here is hovering around 32 F -- warm enough to avoid the icy weather but cold enough to keep me away from my sewing machine. My studio is just a glorified shed. It has a floor, four walls and four single-pane windows, and a roof. There is no insulation anywhere and no ceiling to hinder heat from going out through the roof. With my electric radiator heater turned on high, it's only 15-20 degrees warmer inside than outside. Since I can't work on new sewing projects right now, it's a good time to take a look at one of my UFOs. This is the top that was peeking beneath the red and white Sunrise, Sunset project. 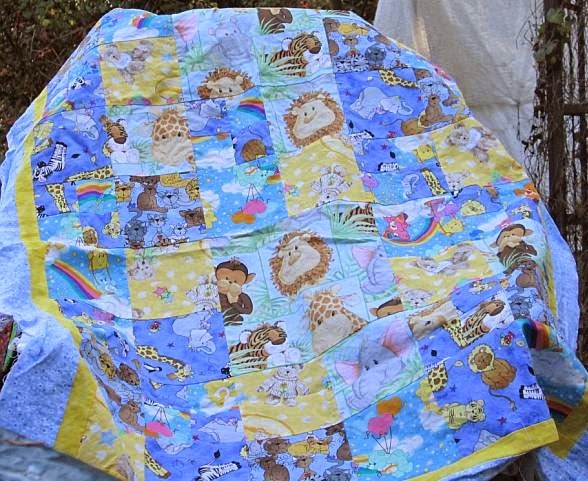 Several years ago, my mom made a baby quilt and had a few scraps left over. I added a few of my own scraps and pieced them all together. 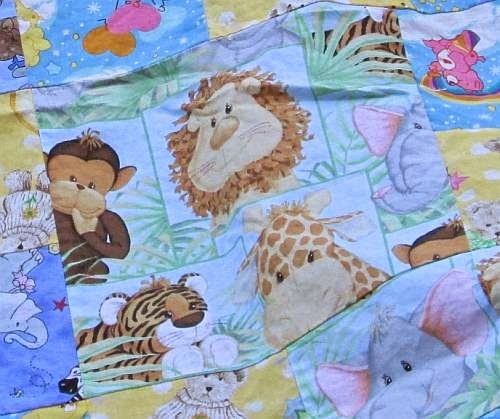 The design inspiration came from one of the fabrics that looked like a montage of baby jungle animals. 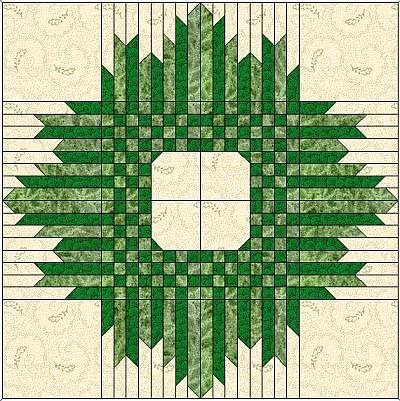 I decided to go with that montage (or collage) effect by making a 4-patch within a 4-patch block. 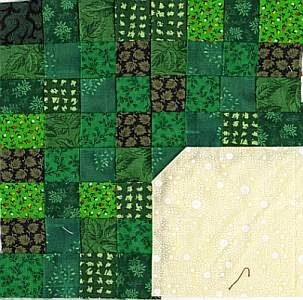 I rotated these blocks different ways and set them with regular 4-patch blocks and two plain blocks of the jungle fabric (I wanted three but didn't have enough fabric for three). 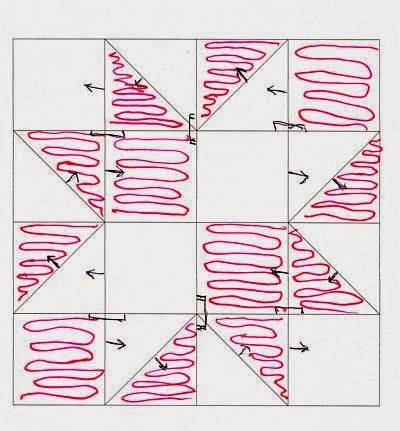 Here's an Electric Quilt representation of the quilt top. 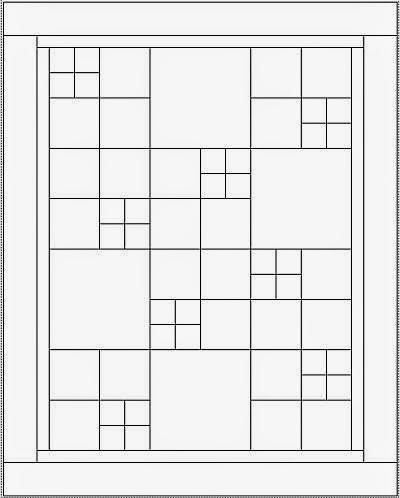 I used 2.5-inch, 4.5-inch, and 8.5-inch squares (cutting measurements). 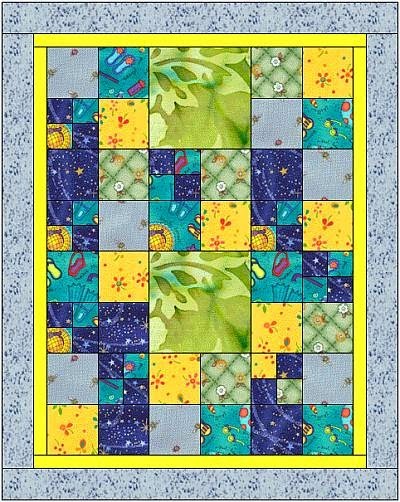 The yellow border was cut 1.5 inches wide and the blue border was cut 3 inches wide. It worked up quickly and was a great way to use scraps that had a theme. 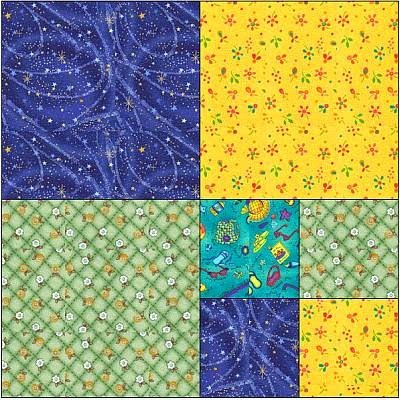 I plan to try this design out again next month to use up some Christmas fabric stash. It was sunny today, so I dared to prop a few quilt tops on a deck chair and take pictures. My dogs were running about in the muddy yard, so I had to work fast before they decided to jump up on the chair and investigate. So you're going to see some wrinkles because I didn't dare take time to smooth them out or lat thing out properly. Here's the Sunrise, Sunset blocks all sewn together! I haven't yet decided how to finish it, but I have until January to play with border ideas. Yes, there is another top under it -- I'll share more about it another day. Below is my infamous chihuahua, Trudy, sitting on my sewing table so that she can look out the window. This mass of fur is Dusty, who refused to show his face. He's on top of the pile of fabrics I pulled out to finish my turkey wall hanging. If I don't get frozen out, I think I can finish that project tomorrow. It's Amazing what I can accomplish when I don't get interrupted every 15 minutes or so! Saturday afternoon, I finished eight blocks. 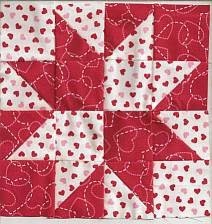 On Sunday afternoon, I had just enough time to sew up the ninth block and then sew the blocks into rows of three before company came. Today, I had sewn two rows together and was halfway through the last one when a car came up the driveway. Trudy, my chihuahua, gets really, really excited when anyone comes and usually runs off to greet them. But the weather has turned cold and the doors are shut most of the time now, so Trudy, unable to contain her excitement, just runs and jumps all over everything indoors. I did my best to ignore her and finish the last seam as she ran back and forth across my sewing table. I paused briefly only for the fractions of seconds when she actually obscured my view. My top, minus borders, is now done! Here are the final steps of constructing the block. 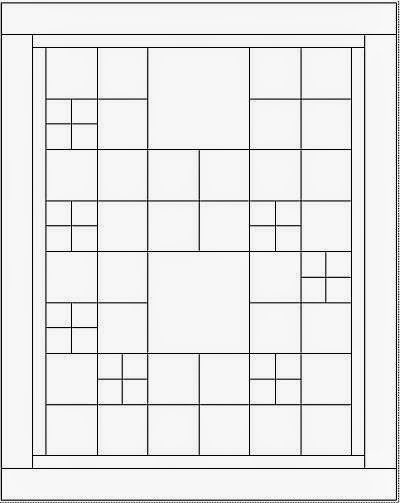 The units made last time are sewn together to make the light and dark quadrants of the block. They look like kitties to me, but they also look a lot like my chihuahua with her pointy ears standing at alert attention. If you're not fond of animals, I suppose they could resemble the feathered end of an arrow. The new seam on both color arrangements is pressed toward the half with the dark square. Now it's time to sew a light quadrant to a dark one. I chose to press this seam toward the dark kitty. Finally, sew two halves together to complete the block. I found it easiest to not press this seam, waiting until I sewed the blocks together so that I could finger press the seams in opposite directions when the time came. I'm putting this project aside until January to add borders and such, but I'll try to get a photo of it tomorrow. 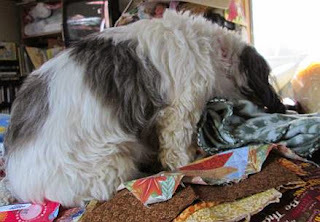 Seems like I have very little time to work on quilting these days. Tuesday was my only day this week to work in my studio without major interruptions. I'm hoping life will settle down soon. I want to get this project done so that I can move on to other things, like finishing a turkey wall hanging before Thanksgiving then making another full-steam-ahead effort at reducing my Christmas fabric stash. So, onward with the Sunrise, Sunset project. This next step is simple, yet it's the most challenging step in the project. 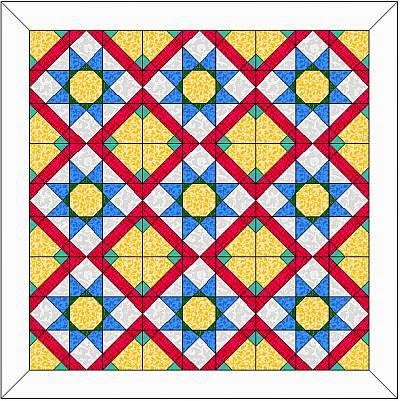 Each half-square triangle unit gets sewn to a square of equal size. Easy-peasy, right? 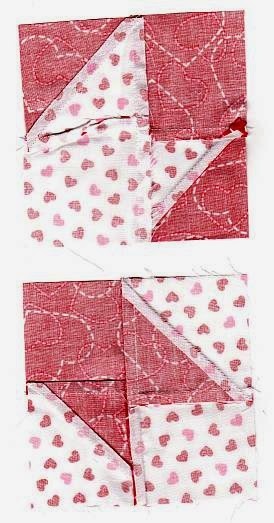 The sewing is easy, the challenging part is getting the triangles turned just the right way. This is when a color diagram (or sample block) and a pressing guide are invaluable. I usually draw mine on post-it notes that I stick to my sewing machine. My post-it note system has worked great for a good 15 years or more, even when I had kitty helpers inspecting everything. Who would have thought that a little chihuahua would throw a monkey wrench into my system? 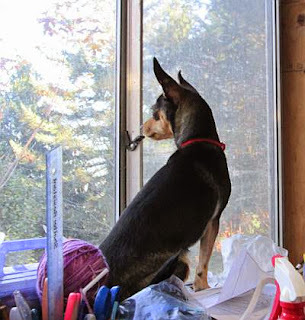 This summer, Trudy learned that she could jump on the arm chair then walk across the side table, jump onto the file cabinet and from it jump onto my L-shaped sewing table. Once up, she prances over all and pokes her nose into every container looking for things. Once she finds something she approves of, she snatches it with her teeth and runs off quick as can be. Her favorite things seem to be spools of thread (not empty spools, they have to be full) and balls or skeins of yarn. I swear she must be half cat! Sometime during this project, Trudy took off with my little post-it note guide. I couldn't find it in my studio and not wanting to walk back to my trailer (where my computer is) to make another, I decided to rely on my memory and sew anyway. I'm paying dearly for that decision now as I try to sew units together that have triangles and seams going the wrong way. Below is a copy of my original pressing guide that also serves as a color placement guide for this block. Basically, there are four placement arrangements in the next units. One block requires two of each. I've arranged them below into groups that I've been calling the "white kitty" and the "red kitty." 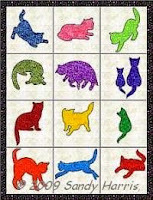 For the white kitty, a dark square is sewn to the light triangle of a HST, and a light square is sewn to the light triangle of a HST. The seams are pressed toward the light triangles. 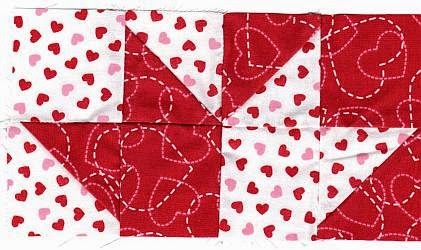 For the red kitty, a light square is sewn to the dark triangle of a HST, and a dark square is sewn to the dark triangle of a HST. 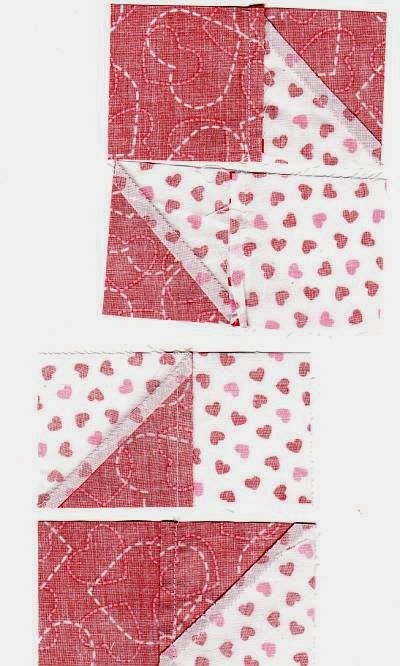 The seams are pressed toward the squares. I sewed enough of these units on Tuesday to make 5 blocks. I'm hoping there's no 7-hour power outage this weekend like there was last weekend so that I can get the rest of these units sewn. Oh, remember that missing post-it note? I found it later stuck to the bottom of my shoe.